Digital Citizenship : Fake News? Learn to recognize common indicators of fake news, understand the consequences of careless sharing, and learn to become a fact-checker. Verify Before You Share Fake News spreads quickly through social media. Be a part of the solution and do a quick fact-check before you share. This module has lots of tools and tips to help you become an expert fact-checker. Check the Source Consider the origin of the news item, whether it is a website, individual author, or organization. Did the news item list its sources, and are they accurately represented? Check an alternate news source to see if and how they have reported the same item. Check your Emotions Was your first reaction righteous anger, or gleeful vindication? Fake news headlines, articles, and memes play on your emotions to get clicks and shares. If you're having a strong emotional response, this is a sign to stop, take a breath, and do some fact-checking. Tendancy for internet users to see only news & ideas that they agree with, or have interest in, due to personalization algorithms of search engine results and social media platform feeds (Jon Martindale, Digital Trends). When we are drawn to information that aligns with our world views and when we hold onto these beliefs, even in the face of compelling evidence to the contrary (NPR). False information which is intended to mislead, especially propaganda issued by a government organization to a rival power or the media (Oxford English Dictionary). Information, especially of a biased or misleading nature, used to promote a political cause or point of view (Oxford English Dictionary). 1. An act intended to trick or dupe; 2. something accepted by fraud or fabrication (Merriam Webster Dictionary). Relating to or denoting circumstances in which objective facts are less influential in shaping public opinion than appeals to emotion and personal belief (Oxford English Dictionary). Something (such as a headline) designed to make readers want to click on a hyperlink especially when the link leads to content of dubious value or interest (Merriam Webster Dictionary). It is often paid for by the advertiser or generates income based on the number of clicks (Urban Dictionary). An insular communication space where everyone agrees with the information and no outside input is allowed (Urban Dictionary). The accusation of 'fake news' is becoming a common way to dismiss any news item that people don't like. 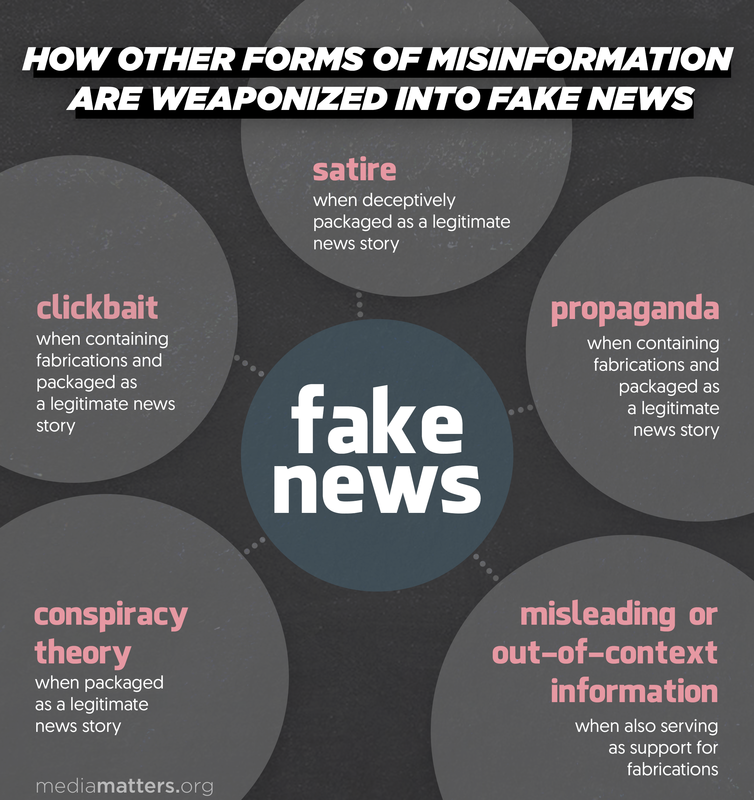 In light of this trend, it is more important than ever to understand what is NOT fake news. Breaking News that is verified and corrected as a situation unfolds may contain factual errors that are later amended. Watch for biased assumptions here. Opinion Pieces, Commentary and Editorials should be labeled as such.so it is clear to the reader. These articles may use oversimplification, hypothetical situations, and hyperbole to make their point. Journalism that makes you uncomfortable, or that clashes with your worldview. Media Bias is not Fake News. Media bias is displayed through the selection of topics, angles, and language to support a general worldview. Most traditional news media are owned by corporations, or are dependent on advertising revenue; therefore they have a vested interest in promoting certain views and pleasing certain demographic groups. BEWARE: Some media outlets mix fake news and deliberate misinformation along with truthful (though biased) reports. Fake News has propelled certain Conspiracy Theories into the mainstream. Examine the URL: fake news sites will mimic the look of a real news site, but the web address will contain clues. Watch for blogging urls, or unusual domain extensions like '.com.co'. Search the name of a news provider to see its bias and reliability rating. Give it a try now, using sources from this page! There is a lot of talk about ways that tech companies can combat fake news, but there are many stumbling blocks. Chrome and Mozilla have a variety of browser extensions that try to flag fake news. If you are trying one out, be sure to check what criteria they use to categorize sites. Some conspiracy sites have created their own detectors that will flag all main stream media as fake! It will be interesting to watch this technology develop, but for now, we recommend that you be your own detective! There is no shortage of material about fake news these days! Though the US is providing a wealth of excellent examples of Fake News, Canada is certainly not immune. Can you think of some Canadian examples of Fake News? 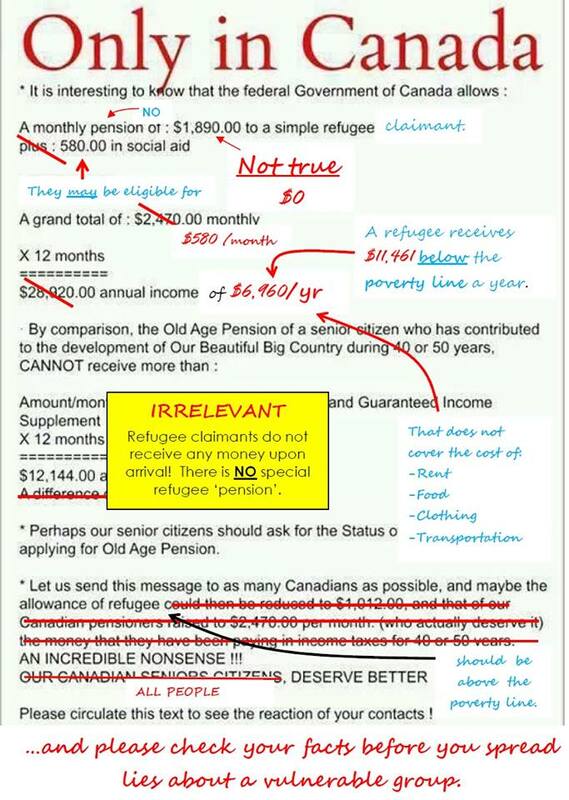 In late 2015, several chain emails & Facebook posts claimed that refugees received more money than pensioners/veterans/welfare recipients. These claims were circulated widely, and are still being shared today. This version is a fact-checked mark-up provided by Dr. Silvia D'Addario and York University students for Canadian Council for Refugees.